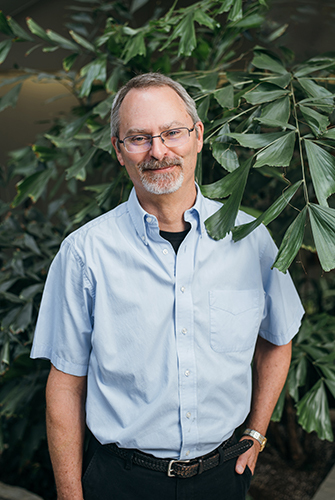 William McKinley '83 has directed Texas A&M University’s Benz School of Floral Design since 2011. 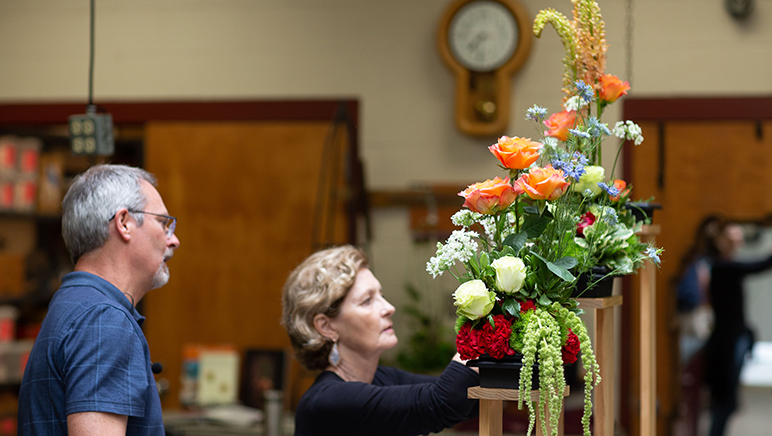 As William McKinley ’83 surveyed each student’s floral arrangement, he spoke of balance, symmetry and asymmetry, line, form, space, texture, rhythm, flow and tension. In his critiques, it became apparent that there is a precise science to floral design that belies the more organic nature of floral arrangements. This philosophy guides the Benz School, which was established at Texas A&M in 1980 through a significant bequest from the late Morris “Buddy” Benz, Class of 1932. The generous gift from his estate has put Texas A&M on the map in this niche industry, allowing countless students to study floral design and make significant contributions to the floral industry worldwide. 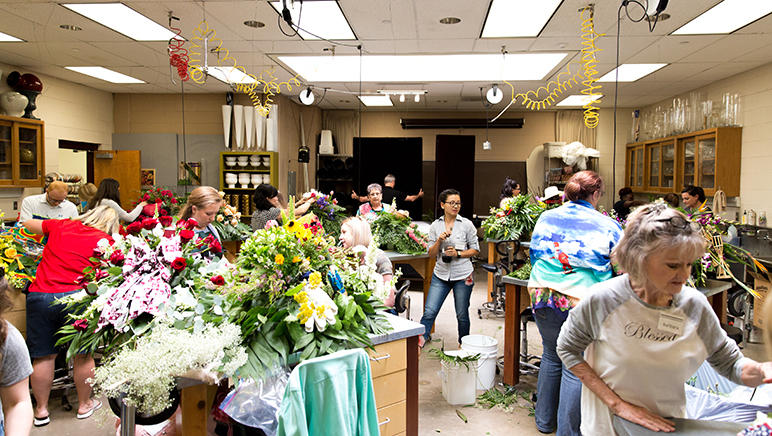 Designed for beginners and professional florists alike, the Benz School offers basic and advanced certification courses that introduce participants to every aspect of the floral business. 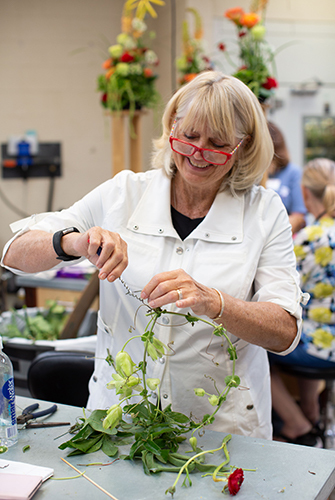 “Topics include the care and handling of cut flowers; wiring and taping; principles and elements of design; and flower shop management,” said McKinley. “Students design event centerpieces, wedding bouquets, sympathy tributes, decorations for receptions and parties, and much more.” In the advanced class, participants also consult with prospective clients and conclude the course with an actual event design. Approximately 50 students participate in summer classes annually, but the Benz School also hosts tours and half-day workshops with garden clubs and high school groups throughout the year. In the summer classes, attendees range from retirees and K-12 agriculture or horticulture teachers to those who aspire to start their own flower shops. In the summer 2018 basic course, one participant was even following in her mother’s footsteps. 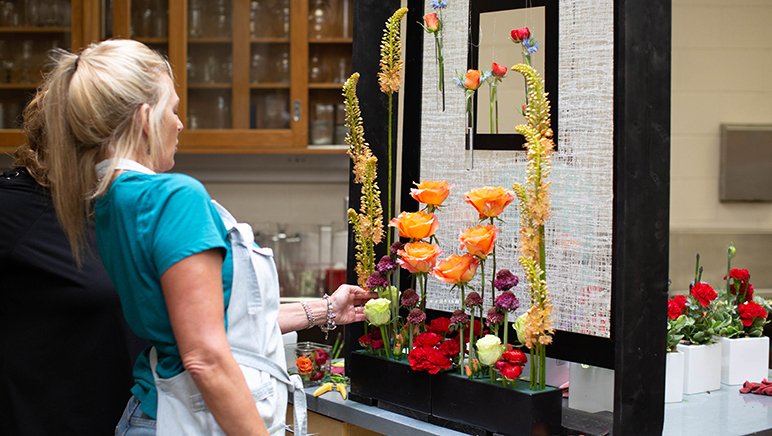 The Benz School strives to teach that floral design is something much deeper than what meets the eye—a refined craft guided by balance, proportion, harmony and contrast. The Benz School hosts tours and workshops for garden clubs, school groups and K-12 teachers throughout the year. McKinley surveys a student’s floral arrangement. 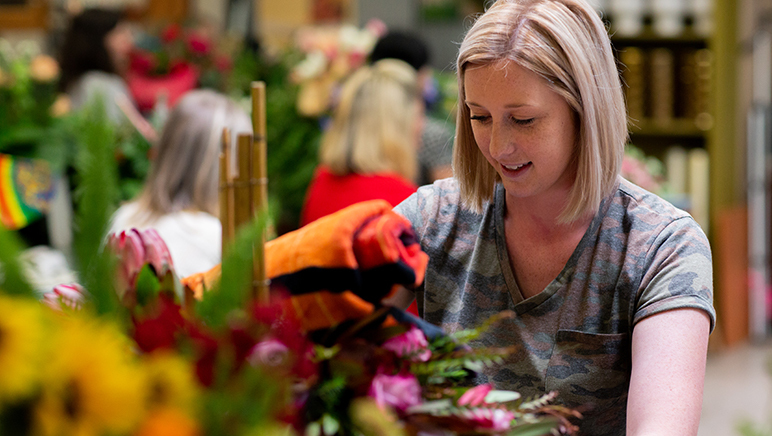 Designed for beginners and professional florists alike, the Benz School offers basic and advanced certification courses that introduce participants to every aspect of the floral business. 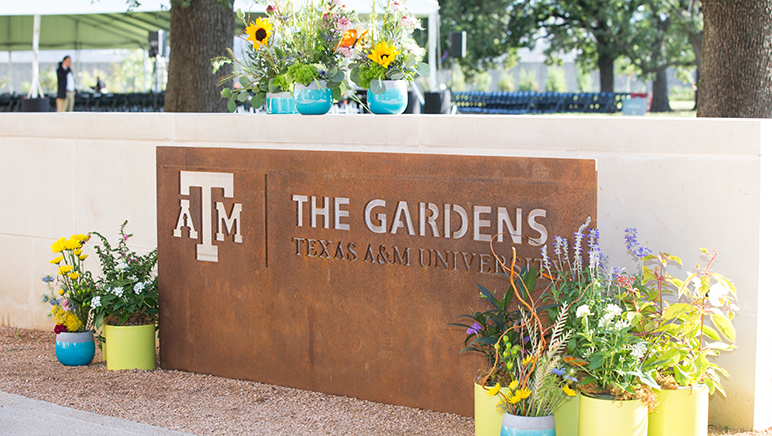 The Benz School provided designed florals for the opening celebration of The Gardens, the new 27-acre public teaching garden project on West Campus. The mechanics Ring references are largely the result of Benz’s groundbreaking influence on the floral industry. He was the first person to base floral design on theory and principles of design. After graduating from Texas A&M and serving in the military, he opened the Benz School of Floral Design in Houston in 1946. He became known for his innovative style and exciting design forms, and as his reputation grew, so too did his travels and exposure to different cultures. Soon he found himself teaching and writing about his theories of design in a series of four books that remain central to the field today. Students learn about topics including the care and handling of cut flowers; wiring and taping; principles and elements of design; and flower shop management. As he neared retirement, Benz decided to establish a unique legacy at Texas A&M through a gift from his estate. First, he created the permanent Benz School within the university’s horticulture department. He also donated his entire library of floral design books and his collection of fine art, acquired through his many travels. This includes some 1,200 art pieces, sculptures, ceramic vessels and accessories used in his floral designs, as well as some 75 works of pictorial art from the Renaissance to the Modernist Periods. Pieces of his collection are on rotating display in the Benz Gallery of Floral Art housed in the atrium of the Horticulture/Forest Science Building at Texas A&M. Today, the Benz School has expanded to include a teaching program in South Korea, after a group of Korean floral design teachers approached Johnson in 2005 asking for the Benz material to be taught in their country. “By 2007, we translated the material and invited 20 teachers to campus for a three-week total immersion session to learn our teaching methods,” said Johnson, who now serves as emeritus director of the Benz School. Today, there are approximately 40 active instructors teaching Benz School methods in Korean private schools, colleges and universities. McKinley travels to Seoul twice per year to evaluate the students of these teachers and to award Benz School certificates. He’s excited that more and more people are learning the Benz School ways and discovering that floral design is something much deeper than meets the eye—a refined craft guided by balance, proportion, harmony and contrast. Johnson, who became hooked on floristry by age 15, is equally enthused. “Benz’s greatest influence on me was the idea that floral design can be an art form, not just a ‘paint by numbers’ exercise,” he said. “It can be something altogether exquisite. Creating a bequest is one of the easiest ways to establish a planned gift through the Texas A&M Foundation, and bequests generate millions of dollars for Texas A&M each year. After adding the Foundation’s bequest language to your will or trust, you can specify that a gift be made to support Texas A&M students, faculty, colleges, programs or student organizations. You can gift a percentage of your estate, a specific amount or the balance of your estate. Benefits include the ability to retain assets during your lifetime, lessen the burden of estate taxes on your family, and establish a Texas A&M legacy. You can view our bequest language here. If you have already made a bequest for Texas A&M in your will or trust but haven't notified the Foundation, please let us know by emailing info@txamfoundation.com or calling (800) 392-3310.